In true Veggie Tales Fashion, Bob and the Gang bring a familiar bible story to life. 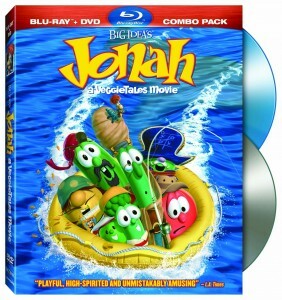 “Jonah”, a 2002 “Big Idea” production, takes the viewer on a not-so-straight voyage into the ancient city of Nineveh, into the well-known tale of “Jonah and the Whale.” The story begins with bickering, jealousy, teasing and contention, and unfolds with the comical twist common to Veggie Tale films. Bob the Tomato, Junior the Asparagus and his dad, Laura the Carrot, and a few other friends, are headed to a concert to which Laura has won a ticket. A mishap (involving porcupines and underwear) lands them in an establishment where they meet a motley group of “Pirates”, made up of the familiar faces of Larry the Cucumber, Mr. Lunt and Pa Grape. These “Pirates Who Don’t Do Anything” serve as the narrators of the story. They introduce us to an asparagus named Jonah ( aka Alfred), who is a “messenger of God”. Jonah is always happy to receive and convey God’s messages to the “Veggies”, until he receives a message that will take him to the infamous city of Nineveh. As we remember from the story in the bible, Jonah choses not to obey God, and avoids going to Nineveh. However, God’s Will always prevails, and in the end, Jonah goes to Nineveh to deliver God’s message to the “Veggies”, albeit in an unconventional way. As the story moves along, we meet a sophisticated camel, an optimistic caterpillar, and a group of rowdy “fish slappers”. And of course, there is a “big music number” to end the show, replete with a gospel-singing angelic host. As with all Veggie Tale films, the emphasis is on a biblical virtue. “Compassion and Mercy” are the themes of Jonah, and the producers do a wonderful job of presenting these moral teachings in a way that even the youngest member of the family can understand. This film is geared toward a younger audience, however it can provide wholesome entertainment for the entire family. From a Catholic perspective, this is a neutral film. There is nothing in it that is contradictory to the Catholic Faith or Catholic Teaching. This Catholic home school family gives it two thumbs up. Sarah Formica, 19 attends St. Vincent College in Latrobe, PA, and is majoring in Computer Information Science. She was homeschooled. This event took place at Catholic Familyland in Bloomingdale, OH.